Burning the Bartle West Witton, Wensleydale, Yorkshire England. 1971. 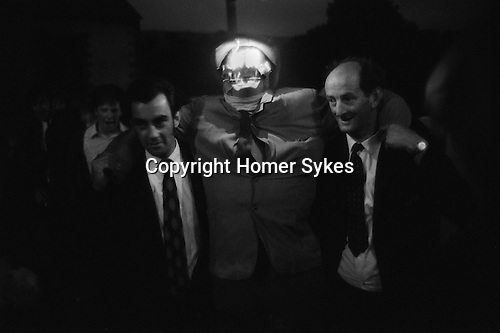 Every year on the Saturday following 24 August (formerly the traditional date for the custom), a large straw effigy known as 'Bartle' is carried in procession by its maker Mr J Alan Harker and assistant down the main street of West Witton, accompanied by a crowd of villagers. This was the 22nd year Alan Harker had made Bartle. Mr J Alan Harker wrote in 1971 "... when it is burnt we have a good old fashioned sing song with a few well know old songs such as My Boney Lies Over the Ocean, Nelly Dean, Coming Round the Mountain etc etc". He goes on to write that Mr G Smirthwaite had records and these were lost in a fire. he left a lot of money to be invested and at Bartle time old people in the village received the interest off the money he left, in 1970 that was £50-00 to the over 75s and £2-00 for the makers of Bartle.